The winners of the EGURTEK AWARDS trophy design were announced on 24 May. First prize went to Silvia Alonso Altuzarra, a student at UPV-EHU Fine Arts faculty, who came ahead of more than 20 other entrants. 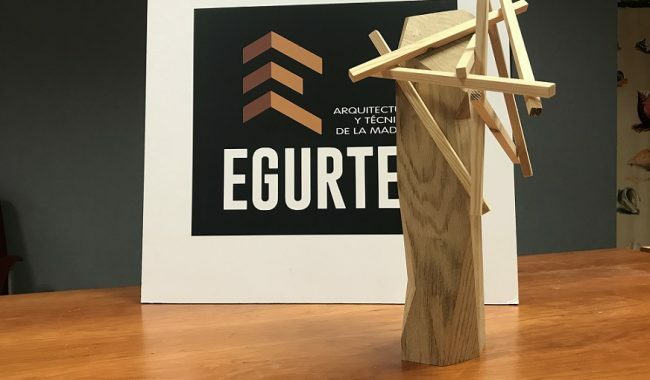 The initiative, organised by the University of the Basque Country, Egurtek and Baskegur, ran over two terms of the 2017-2018 academic year, during which Fine Arts students worked with wood to design a singular trophy for the winners of the Architecture and Design Awards, taking place at the BEC on 19 October. The runners up, with special mention, were Leire Grijalvo and Joana Akaiturri.